This Wednesday, June 3rd, the Richard L. Evans Chair of Religious Understanding at BYU will be sponsoring an academic symposium entitled “Sacred Space.” The symposium will commence at 9:15 a.m. at the Gordon B. Hinckley Center at Brigham Young University, with a welcome from President Cecil O. Samuelson. Presenters will include Terryl Givens, Richard A. Cohen, Jeanne H. Kilde, Hamid Mavani, Michael Fishbane, Steven Olsen, and Laurie Maffly-Kipp. There will also be a panel discussion in the evening with Richard Bushman as moderator. 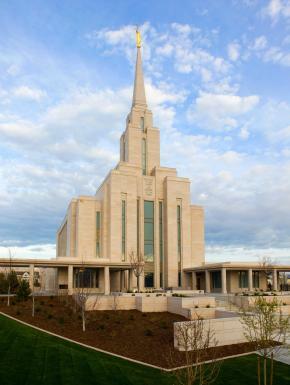 The symposium comes in recognition of the open house of the new Oquirrh Mountain Temple, and will discuss the idea of sacred space among several scholars of different religious backgrounds. It should be very interesting. I’m planning on attending. I’m still unsure whether I will liveblog it or not. The last time I liveblogged a BYU conference, it did not seem like there was that much interest. Let me know if you would be interested in a liveblog. More information, including presentation topics, can be found at the Times and Seasons blog, and this BYU News Release. Just a blog afterwards would be great, please! I’m jealous – appreciate your opportunities, we never get to go to things like that in Europe! I agree with Katherine and Reed – please take great notes and tell us all the interesting things that you hear! Please a blog afterwards, I am in Belgium and cannot attend for obvious reasons. This (and your other blogs) are great opportunities for us Europeans to share in such events. I’m looking forward to reading your notes. This is one of the few things that makes me long to live in Utah again.